The only thing better than a mug of hot coffee around the holidays is a mug of hot chocolate. It takes me right back to my childhood, which was a time when I drink considerably more hot chocolate than coffee. I usually make my own hot chocolate, but there are many times when I want something quicker and easier than the from-scratch stuff. 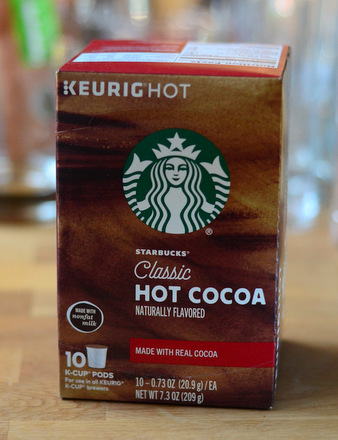 Enter Starbucks Classic Hot Chocolate K-Cups, a very fast and easy way to get your hot chocolate fix. The cups are loaded with a mixture of real cocoa powder, sugar, milk, chocolate extract and some other natural flavorings. It’s a similar mix of ingredients to what you would find in a container of good quality powdered hot cocoa mix. They brew just like a regular k-cup and I recommend sticking to a 6 or 8-oz setting, depending on how rich you want your hot chocolate to be. The drink has a very good chocolate flavor and just enough milk to make it creamy. It’s not overly sweet and pairs perfectly with marshmallows or whipped cream. In short, it’s pretty darn good and hits the spot perfectly when a hot chocolate craving strikes.